Despite its impressive name, this variant is smaller than the standard ATI FX45 1911. It%u2019s meant for concealed carry due to the hammer design, smooth rear sights, and shorter barrel. The chrome trigger adds a bit of flash to the otherwise matte black finish and mahogany grips. BEST ANSWER: The gun a single magazine and a lock. The gun works fabulously. I purchased 3 Colt magazines for it and they work great. I previously purchased 3 mags from e bay and they did not fit so stick with the colt mags. This gun is worth every dime. A 1911 .45 ACP pistol with Novak style sights. One )1) 7 round magazine and the owners manual. Read the manual carefully. If manual is like mine, i'ts an older printing in which the length of warranty is incorrect. This pistol has a lifetime warranty. From what I recall, I purchased mine about a year ago, the box contained the pistol, magazine, instruction manual and I think a cable lock. The box contains the gun, one magazine, owner's manual and a gun lock. Mine came in a nice hard case with manual, lock, range flag and 1 mag. The gun, one mag and info pack. The gun, a mag and a manual. Most accurate 1911 I own. Light trigger pull. This is a very nice compact 1911 for the money. It may not be a colt but still just as good as any Rock island or Remington. Makes a good ccw if you dont mind the weight being an all steel pistol. Make sure to give it a good cleaning because it comes packed in a lot of oil/grease. Read alot of reviews on this gun and people said that they don't run. Most of the reviews take the gun to the range from the store and shoot. This weapon justs needs a good cleaning before shooting. Put 50 rds thru the first day and no hickups. Another 100 and still not the first problem. A great starter gun with a great price point. Would reccomend to any friend or low budget 1911 shooter. I'm happy with it I cleaned it and took it to the range no problems. A bit heavy but not bad. Fun gun to shoot, very powerful due to caliber and gun size combination. Does have some issues at first from the slide not going all the way back forward after shooting but with a good cleaning and oiling and maybe a swap to a higher quality magazine this can be fixed! Overall a great purchase. Got it. Cleaned it. Took it out. Fired great. Smooth and accurate. Next time out, every other round failed to eject, and my slide closed after firing the last round. I sent it out to ATI, and within a week, i got it back. They replaced the slide stop, and it's been nothing but a joy since. Love this gun. And the price point is unbeatable. ATI is doing good work for affordable firearms the are still quality. I was very unsure about purchasing this firearm because of the reviews on it. .but I took a chance anyway well let me say when I received it i was very shock how well built it was ..very solid ..took it to the range ran 200 rds of walmart finest lol Winchester white box federal aluminum and tula to my surprise from reading other comments about guide rod and spring and mag..I must be very lucky because I had absolutely no problems with gun or mag it ran flawlessly. .not 1 ftf no problem going into battery mag ran excellent very satisfied. Oh by the way the trigger pull is nice also. .goes to show a name means nothing. If you buy this gun, I hily recomend buying a spring /guidrod combo for a kimber ultra carry 2 and replace the factory one. I had nuthing but problems with mine befor, after, not 1 malfunction several hundred rounds later. even shoots HP ammo great. Fit and finish is very good and the gun is super tight. 1st trip to range after a cleaning and every other round failed to feed with factory mag. Used a factory Colt mag and about one out of each magazine would fail to feed. Replaced factory magazine with ProMag Colt Defender magazine, polished feed ramps and took it back. 200 rounds without a hiccup. I use it now confidently as my daily CC and don't have to worry about scratching it up. Great value with very minor work to make it run like a sewing machine. 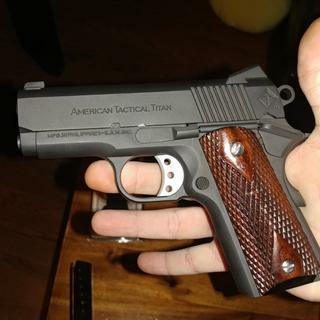 This compact 1911 is great. It is very well machined and the parts fit perfectly together. My only criticism is that the recoil guide rod seems to be the type that breaks, The Kimber or Colt recoil assemblies work just fine according to many sources, so I'm not worried. Best part: I paid $200 less than Gander Mt's price! ATI Firepower Xtreme .45ACP caliber 1911 pistol series from Shooters Arms Manufacturing in the Philippines. Available in 5 different models, from classic military, competition and bull barrel designs, the FX 1911 series features all steel parts, solid mahogany grips and a price point that wont break the bank. Compatible with many different brands of 1911 magazine, the FX series is certain to have the 1911 pistol enthusiast set for hours of satisfactory shooting.